Where to go, what to do? If you’re not the wild, crazy, adventurous type, living in a place you’re not very familiar with — such as a new PCS location — can make getting out of the house and heading out into the great unknown feel like a chore. Why? Because… first you have to figure out what is even out there that you want to see or do… then you have to figure out how to get there and how long it will take… and then you must invest even more time in figuring out getting back home. Phew. That can be mentally and emotionally overwhelming for some of us. 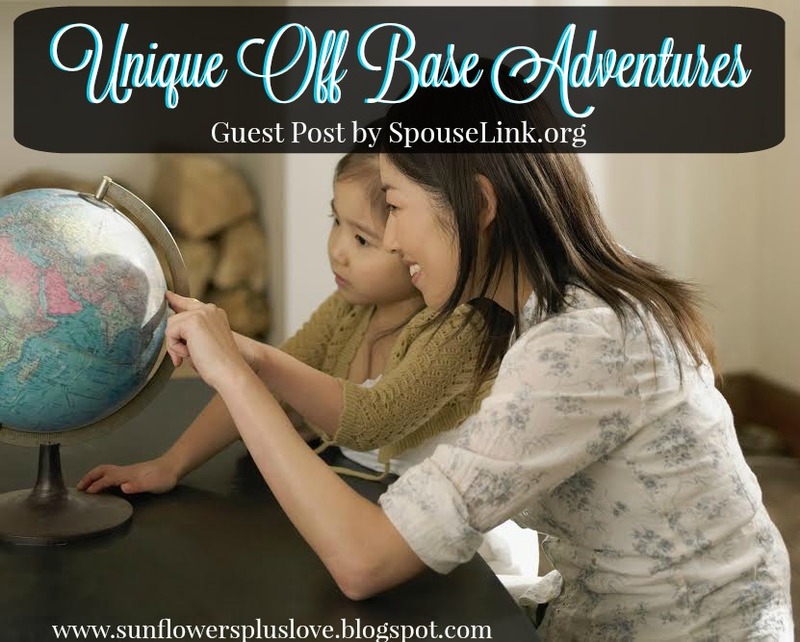 But… consider this: if you’re living on base/post and too afraid to venture out on your own — away from the known environment — you could be missing out on all of the special things that make your present hometown so unique. So how do you rally your adventurous side to get up and go out? 1) Consider how far you’re willing to go. Feel the need to stay close to home so you can return within a reasonable amount of time and distance? Map out a 20-minute adventure radius. 2) Decide what you’re in the mood for. Do you want to go see a new movie? Are you in the mood for outlet shopping? Want to take a long bike ride along a forested trail? Choose one thing you’d like to accomplish with your outing and figure out where you can go to do it within your 20-minute zone. 3) Research the area. Before you blindly head out to accomplish your adventure, make sure the area you are heading into is a comfortable one, with familiar stores or restaurants nearby. If it looks like you’ll be heading out into a bad area, choose a different direction. 4) Think about who’s going. Will you be on your own? With your kids? With a friend? With a group? If you’re taking separate cars, make sure everyone remains in sight. If you’re going it alone, be sure to take your phone or other communication device with you. 5) Take provisions. Even if you’re heading into an area with restaurants and shopping venues, it’s important to keep a selection of snacks in your car, backpack or purse. That way, you won’t go hungry when you’re sitting in traffic, or walking a footpath that takes longer than expected. You should also keep a first-aid kit handy… just in case. Now that you know where you’re going, what you’re doing and how you’ll get there… it’s time to venture out. When you do, woe of the most important things you need to keep in mind is that people live here all year round… wherever you are (unless, perhaps, you’re in an untamed wilderness). There are many people around who can help you navigate your way, point you in the right direction, help you figure out the local language, etc., if you need assistance. You just have to ask. And remember to be smart: Start simple. If you’ve lived in a big East Coast city all your life, you probably don’t want to trek out into a hot, dry desert on your own, since you won’t have the necessary first-hand, life-long survival skills ready to go, should you or anyone else in your party need them. Conversely, if you lived on a Midwestern farm throughout your childhood and now find yourself surrounded by cars that zoom past pedestrians without a thought, you will need to be prepared to experience the local culture in a blur… and accept it for what it is. Embrace the environment you’re in. Meld yourself into it as best you can. That doesn’t mean becoming a whole new person just to blend in. It simply means focusing on your end goal… which should always be: happiness. So what if you don’t like country music and everyone around you only line dances? Look at it not as a personal issue but as an opportunity. Instead of saying, “I don’t want to go there because they do [fill in the blank],” flip the thought around and be curious. Get excited about experiencing something new. At home, you can always be the full, real you… rocking out to Indy tunes or oldies on your iPod. But when you’re out and about, allow yourself to dive into the mood, history, culture, sights, scents and sounds of your duty location. It will broaden your horizons in ways others never experience in their lifetimes. But… what if you’ve moved to a location that is more secluded, with clear boundaries and an imbalance of excitement and activity that you’re used to in your “normal” daily life? Again, do a little research online to see what is unique about the area, and then go out and see it. Even just visiting a nearby library can yield interesting clues about what’s important in the area. Find out how the town was first established. Visit local museums. Learn a new craft. Taste new foods. Enjoy listening to local accents and colloquialisms. Take a group tour around town. Look for things that are “missing” and see if you can fill that gap by creating something or adding your talents. For instance, are you a skilled writer? Maybe a local organization could use your help producing its monthly newsletter. Do you love animals? How about volunteering at a homeless pet shelter. Are you good with kids? Help out at a neighborhood school. Like helping the elderly? Visit a home with old folks who will look forward to seeing you every once in a while. The real trick to any adventure is being passionate about it… and true to yourself. Think of yourself as a tourist, not an outsider. Don’t let your on-base/post status keep you from enjoying the world around you. Every experience you have will provide you with information you can share with others — whether or not they are in the same situation you are — because sharing all kinds of experiences with others is one of the ways we make life itself an adventure. AAFMAA is the longest-standing not-for- profit association that empowers current and former military with affordable financial solutions including, life insurance, investment management, and survivor assistance. AAFMAA is also the creator of SpouseLink, a free website for Military Spouses that was created to support, inform and inspire users with a variety of content–anything from pop culture to important Military information.